There will be two kinds of auction houses in the near future–those that adapt to the Internet and accept changing times and those that close shop because they are too stubborn to adapt their businesses. Proxiblog takes some credit in helping coin auctioneers sharpen their photos and lot descriptions. We regularly tout best online practices, too. Over time, we have seen dramatic improvement in all aspects of online numismatics on Proxibid. True, there are a few top houses houses that still can sharpen their photography because they cannot capture luster of coins. But where we see the last dregs of stubbornness is in shipping. As soon as we read this in the service terms, we went to another auction. Look, don’t insult your bidders with words like “No Exceptions!! !” And don’t fine them for bidding, especially when you refuse to change and provide in-house shipping. And why are you criticizing Proxibid? We don’t want you to have access to our credit card numbers to give to a third-party shipper. That’s why we trust Proxibid, and trust is key in developing online clientele. Sorry. We won’t do your work for you. You arrange for shipping without our having to contact you for information you fail to provide in your service terms. Bidders are free to patronize whatever company they like, of course. As for us, our rule is simple: If you can’t ship, you’re on a sinking ship. We won’t bid. 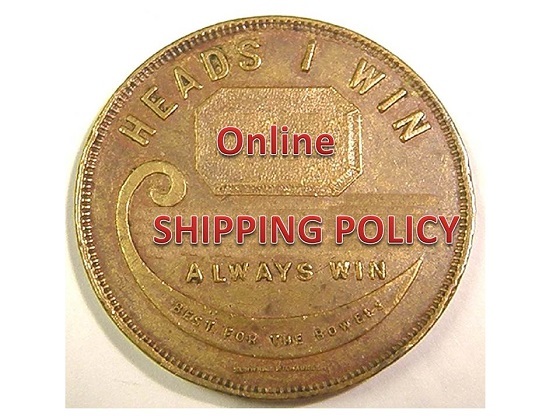 This entry was posted in Best Practices, Uncategorized and tagged American Numismatic Association, Auctioneers, Best Practices, Coin Auction, iCollector, National Auctioneer Association, Proxibid, Proxiblog, Shipping. Bookmark the permalink.